This iteration of that scenario focuses on John Cale (Channing Tatum), a D.C. cop assigned to protect the Speaker of the House (Richard Jenkins) but who's really aiming to get himself recruited into the Secret Service. However, the lack of commitment that's hindered his career has also damaged his relationship with his teenage daughter Emily (Joey King) and to score some good dad points, he arranges for them to take a tour of the White House. Unfortunately he chooses the absolute worst day to visit, as a crew of armed intruders storm the building seeking to capture President James Sawyer (Jamie Foxx) on the eve of his controversial plan to withdraw all U.S. forces from the Middle East. Separated from Emily, John takes matters into his own hands, teaming up with the Commander-in-Chief to rescue his daughter and reach safety. Similarly to Olympus Has Fallen, White House Down has been described as Die Hard in the White House and that feels like exactly what it's aiming to be. In fact, one can so easily imagine John McClane dropped into this situation that it wouldn't have surprised me if the script had originally been developed to be just that. 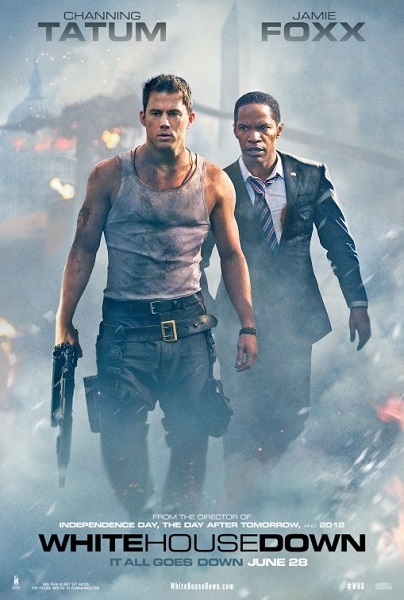 But even without Bruce Willis, White House Down proves to be a better Die Hard film than the last two entries in that series have been. It also proves to be a lot more fun than Olympus was. Part of this relates to the film's politics, which of course will be a dividing line for many audiences members. Olympus had a right-wing hardliner flavor to it, advocating jingoistic might over negotiation when it comes to foreign relations, whereas White House Down takes the liberal approach, arguing the paradoxical idea that the peace process is worth fighting for, especially when your opponents are corporate interests and militarist warhawks at home. The other key element of one of tone and that's where Emmerich comes in. He's made a quite successful career by polishing off the excesses of the Irwin Allen disaster cycle of the 1970s for new generations, both in terms of the broad scale of destruction onscreen or the melodramatic tribulations faced by each character in the usually star-studded ensemble. With Emmerich's name in the credits, you can usually count on at least one national monument or landmark going boom (the Capitol Building in this case) and some pair of estranged characters learning to bridge the distance between them amidst danger. Getting the overblown plots of his movies to work usually depends on him hitting just the right tone between earnest sincerity and winking self-awareness. Happily for the most part, Emmerich gets the balance right, particularly in comparison to Olympus, which presented a meaner and rather sanctimonious take on Oval Office carnage. A lot of the story we're presented with here is just as moronic and implausible as in that film but the key difference is that Emmerich seems to be aware of how silly it all is, with each wisecrack or cartoony bit player giving us a bit more license to enjoy it, even as the bullets start flying. The PG-13 rating ensures that while the violence level is high, the gore is muted and we're spared the gruesome imagery of hapless civilians being mowed down that Olympus seemed to revel in. There's still a lot of wreckage though and I wonder if one of the big takeaways from this past summer will be that audiences have become weary of property destruction as entertainment. The screenplay is, by its nature, pretty derivative of similar siege plots and there's little here to surprise us. A few sequences and specific stunts are direct repeats from Olympus and the supposed twists regarding who's behind the scheme are pretty apparent from far off. There are also some gaping plot holes, such why the villains are so desperate to capture Sawyer for access to the U.S. nuclear arsenal even though we see them succeed in launching a missile without Sawyer's cooperation. There's also a hilarious amount of set-up and pay-off, with everything from a throwaway line about the pen being mightier than the sword to a random character trait like Emily's talent at flag-spinning coming into play before the credits. A positive attribute of thing is the inclusion of little humours touches that elevate the archetypal characters into something a bit more individualistic, starting with John Cale, an action figure cut from the McClane mold than Butler's Steven Seagall-style automaton from Olympus. Formerly Special Forces, Cale has the instincts and skills to deal with the threat at hand but is totally clueless and unhip when it comes to relating to his daughter. The fact that so much of his character is motivated by a desire to be taken seriously by her is endearing in its desperation. I find myself continually surprised about how much I've been enjoying Tatum's work recently, which I think stems in large part from his willingness to not take himself seriously and to play to the more humorous flaws of his characters. 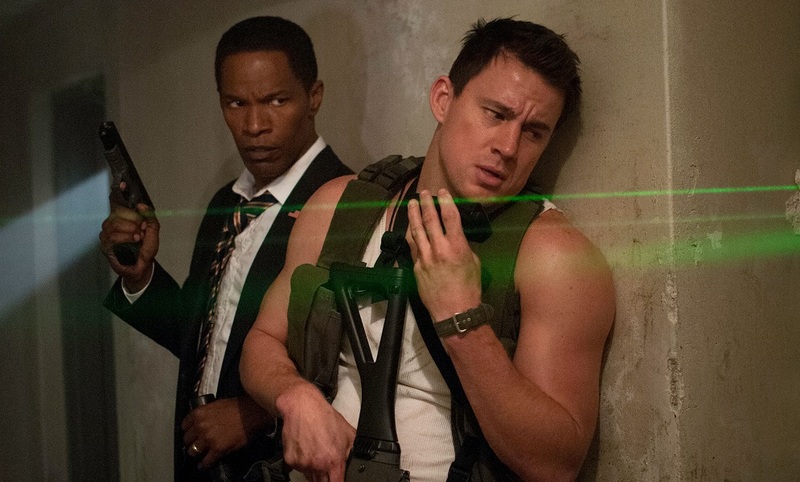 Since the film is also structured as a buddy movie, it's fortunate that Tatum manages to gel pretty well with Foxx. Generally we're used to seeing the leader of the free world ally himself with senators to push legislation through, not blast missiles at bad guys, but the fact that the peace-loving politician is so out of his element makes their partnership all the more fun. Foxx isn't totally successful at imparting a sufficiently presidential bearing, possibly because even in his mid-forties he seems a bit young to be elected president. However, he follows Emmerich and Tatum's lead and finds the same balance of playful daftness and earnest conviction. The decision to have Cale's daughter Emily idolize Sawyer allows for a refreshing portrait of a socially conscious and politically active teenager. With most teenagers in film portrayed as glib and often apathetic, it's great to see one who grasps the implications of what's happening and is brave enough to put herself at risk and King ably captures Emily's terror, intelligence and idealistic courage. 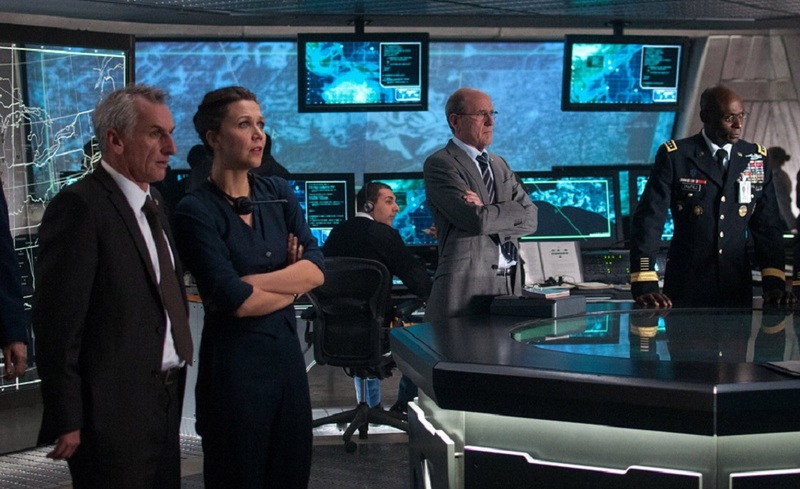 As standard with an Emmerich film there are a lot of familiar faces in the supporting cast, including James Woods and Jason Clarke as the head villains. Woods can do crazy in his sleep, but thankfully he holds it back a lot here, lending an air of tragic purpose to his treasonous Secret Service chief. Those familiar with Woods' often outspoken political beliefs and his 9/11 experiences may find his character's true motivations humorously apt. Up-and-comer Clarke is another sly casting choice as a former Special Forces operative angry about being abandoned in the field since the role carries echoes of his sidelined torturer in Zero Dark Thirty. He uses the character's growing anger over the loss of his fellow mercs to humanize an otherwise brutish thug. The villainous ranks are filled with a strange and colorful assortment of rogues, from racist skinheads to a geek-chic hacker (Jimmi Simpson), all of whom have their own motives for striking at Sawyer's administration. On the side of good, Maggie Gyllenhaal plays Woods' protégé and happily gets a bit more to do than her opening scenes, in which she delivers all the exposition we need for Cale, would hint at. 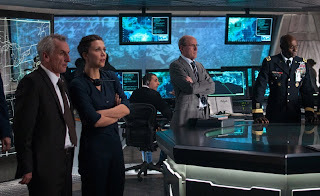 She avoids being marginalized into a love interest, instead struggling to manage the crisis while contending with an aggressive Pentagon general (Lance Reddick) eager to resort to an all-out assault on the White House. Jenkins has always been convincing at portraying banal bureaucrats and does fine in that regard here. We also get bit appearances by Matt Craven, Michael Murphy and Rachel Lefevre. My only complaint is that the wonderfully likeable Jake Weber is wasted in a tiny part as one of Gyllenhaal's fellow agents. 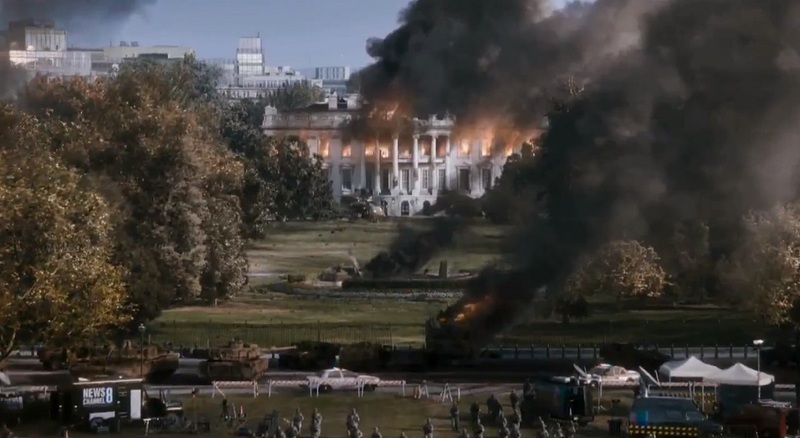 White House Down is in no way the kind of enthralling action epic that the original and genuine Die Hard is. Hell, it's quite a few levels below Air Force One. However, it's a diverting and harmless enough way to pass a few hours in an air-conditioned theater and it does have the novelty of not being a sequel, though one might argue that the existence of its cinematic doppelgänger makes it virtually a remake. But then, isn't that just like politics. It doesn't matter who holds power at the box office or the White House; after a while, they all start to sound the same. At least I had fun, despite all of the silliness of the material. Good review Tim. Me too. I wish it had done a bit better.